Not dominated but, seems rather fitting! I would like to wish all of you a very wonderful holiday season, enjoy!! While its not the size of it, it does dominate the picture. Kind of like Iron Chef. They can put a hint of something in a dish, but the dish is definitely about the secret ingredient. Just like this! Love it! Beautiful! Nice light, detail, and DoF. Thanx for the comments! To tell you the truth, this was a spur of the moment photo, gotta love them eh!! Red always dominates a photo because it pops, IMO. 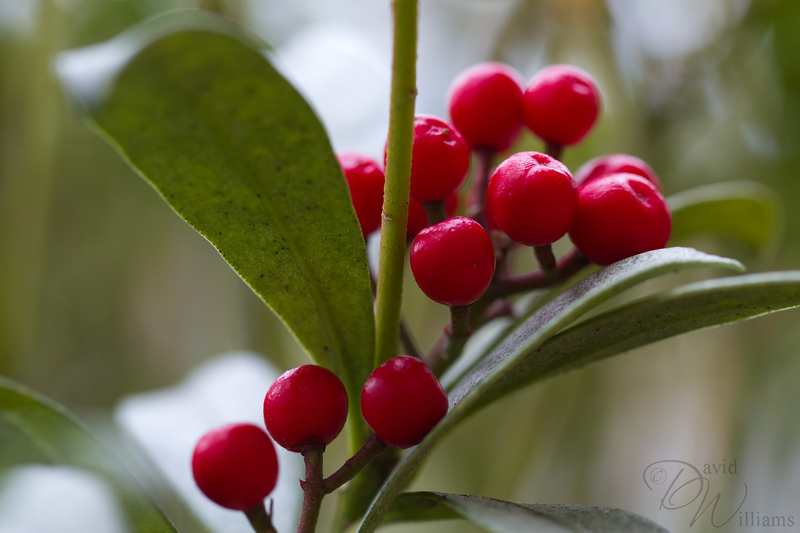 This is beautiful with the bright red berries against the green leaves and the lovely soft light. Thank you for stopping by Karen, your comments are always welcomed! Lovely colors and details on the winter berries. 😀 Thanx Sasi, hope you and your family had a great Christmas. Very pretty. Love the vibrancy of the colours and the lighting. Thank you Heather, always appreciated! Well done, David! This is a great representation of red! Merry Christmas! Thank you! Hope you and your family had a great Christmas! Thank you for the comment, sorry it’s taken me awhile to respond…crazy busy times! 😀 Hope to see you around and that you too, are having a great holiday!